Brody Beaver is a guided missile. 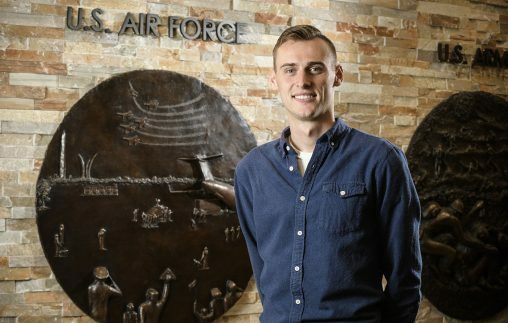 Determined to become an Air Force pilot, most everything the Wright State University mass communication student has done recently is with that in mind. 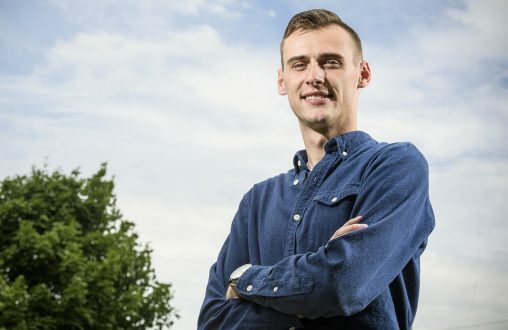 Beaver, 22, has enlisted in the Air Force, earned his private pilot’s license, is a member of the Ohio Air National Guard helping flight crews with logistics, has written articles on aviation history and even has his own photography business using drones. “I’m continuing to set myself up for success to be a pilot for the Air Force — my childhood dream,” he said. That dream began at an early age. Beaver grew up in Grove City, Ohio. His father was in the Air Force for 21 years, working in aviation resource management systems. It was when he was in seventh grade that Beaver decided he wanted to join the Air Force and become a pilot. So when he turned 17 while at Grove City High School, he enlisted, having to get a permission slip from his parents because he was under 18. Beaver plans to make a career of the Air Force. “They’ll probably have to kick me out at 60,” he said with a smile. After graduating high school in 2014, Beaver underwent military training for two years in San Antonio, Texas, and Biloxi, Mississippi. He then returned to Ohio, where he attended Sinclair College so he could earn his pilot’s license. At the time, he was based in Springfield with the Ohio Air National Guard and had heard good things about Wright State. So he later transferred from Sinclair to Wright State without even taking a college visit. Beaver majored in mass communication because he enjoys talking to people and being in front of a camera. While his dream is to become an Air Force pilot, Beaver believes having a mass communication degree is a great fallback. “It’s just something I absolutely love — PR, being a DJ, being a news anchor or a journalist,” he said. Beaver’s public-speaking skills recently got him gigs as master of ceremonies for a military ball and for the Ohio Airman of the Year ceremony, attended by commanders. Beaver says Wright State has set him up for success in communication. Beaver has also worked with Wright State’s Special Collections and Archives, writing articles about some of the artifacts stored and displayed there. Beaver also recently volunteered at the National Museum of the United States Air Force, helping teach children the basics of flying in a flight simulator. In addition, he has earned his commercial drone license and started his own business called Just Drone It. He takes aerial photos and videos for real estate agents and their listings. He also does weddings and other family functions. Beaver keeps his flying skills sharp by renting airplanes and flying around the state. Beaver is a busy guy. So what does he do to relax? No surprise there. He goes flying.